A call to Thom Conboy at Merle Wood & Associates brings news that he's signed Broward's 30.48m motor yacht Insatiable for sale. Built in 1985 and refitted in 2000, Insatiable has deluxe cruising accommodation for six to eight guests in three staterooms. The king size master suite is full beam in width and has a dressing table, extensive storage, a full entertainment center with VCR, DVD, DSS, Surround Sound, and an en suite bath with Jacuzzi. The two guest staterooms each have double beds plus a fold down Pullman berth, en suite bath with shower, Satellite TV/VCR and CD Stereo. 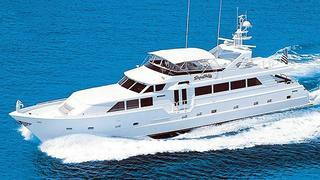 Twin 870hp Detroit Diesel engines give her a cruising speed of 10 knots. Insatiable is asking $1.25 million.